You can't listen to The Drift. It doesn't let you. The voice; there's something wrong with the voice. Is Walker singing in tune? What happened to his tone? Is that warble supposed to be there? I think he's dying. He's old and a recluse and unhealthy. He wears a baseball cap everywhere and gets no light. I am sure he's dying of something. It must be cancer, the wasting disease. The one we can't stop. But "Cossacks Are" eases you in. There are drums that make a rhythm and jangling guitars and a bass, though maybe it's playing only one note. You might interpolate a melody. All of this is fairly conventional. 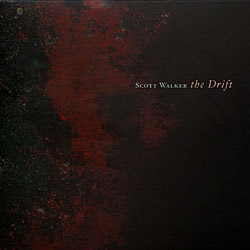 The lyrics are excerpts from reviews of Scott Walker's previous albums. So maybe there is irony here. ("It is hard to pick the worst moment.") Humour. ("You can easily picture this in the current top ten.") Self-reflection. Those are all things we can understand as part of a human process. Likely you have never heard anything like this song, but it is easing you in to the rest of the album. Turn off the record after that track. Hit stop on the CD player, lift the tone-arm, disconnect your headphones. I am not kidding: you must do this. Go about some other business. Feed the cat, hold your loved ones, do the dishes. Please believe me. You need to do these things. Then come back for track two. "Clara" is the end of the world. It begins with synthetic clatter that is announced as birds. This is a true statement; these sounds are birds. (My cats agree.) Then, with a jolt, something starts coming through. There are different sections and things happen sonically we might be able to call music. The vocal line is all over the place. It thinks there is a melody somewhere but it's not too sure. This is the thread of a life looking for pattern. I know there is meaning somewhere in what I do, but I am not too sure. I have to pick my way and trust to where I am going. The singer is a cancerous sleepwalker. It might help to know that the subject matter is Mussolini's mistress, who chose to die with him after the collapse of the fascist axis. And suffered the same fate of having her corpse strung up on a hook, kicked and beaten in the street. This song is that sound. We actually hear it. There is nothing that will convince me I wasn't in Piazza Loreto in 1945. I have actually been there now, by way of this music. "This is not a terrapin, with its shell torn away. Like what happened in America." The ending is pure magic. A recitation; a poem. "Clara" is the best song of the decade, in form, content, clarity and ambiguity, delivery and confidence. But after it ends, dare you go on? There are sounds that follow that simply cannot be heard. "Jesse" starts with Walker doing a child's imitation of the planes hitting the World Trade Center twin towers... "pow, pow!" And then the first line: "Nose-holes caked in black cocaine." Impossible as it seems, the lyrics then take into their fold Elvis Presley's stillborn twin brother. What verve! "In my dream I am crawling around on my hands and knees, smoothing out the prairie." Seven more songs follow, but it's no use. You cannot listen to this album. I think instead that it is listening to us, feeding back into our ears our worst fears, the dark bitumen of the soul, that which is bitter and inescapable, which seeps out and stains. There is no album even remotely close to this one released this decade. It points a way into a land we, if sane, dare not enter. But which we, if alive, have no choice but to traverse. Listen to it one song at a time. Take comfort in the world around you. Stay close to friends. Read another take on this Album of the decade.